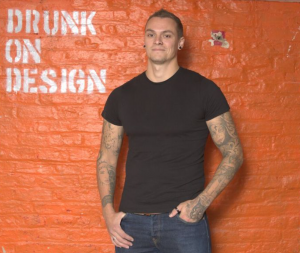 Following years of delivering unique and engaging campaigns for clients across the UK, Drunk Animal is in the process of vastly developing its base in Hull. Calvin Innes started off with a vision in December 2013 and has now transformed Drunk Animal Creative Studio into a household name synonymous with using imagination and disruptive platforms to inspire positive change. Drunk Animal’s rapid expansion is thanks to its national portfolio. By originally focusing primarily on major cities such as London, Manchester and Liverpool, the company has built an impressive client base across sectors as diverse as education, events, dining and business mentoring. Through first-hand experience of how larger urban hotspots engage the public and keep brands fresh, the team in Hull can now share incredible visions with local audiences. The Drunk Animal team is based in the historic Kingston Chambers on Princes Dock Street. Managing Director, Calvin Innes, is now busy transforming this fantastic building into a 21st-century creative hub that fuels conversations and promotes the sharing of ideas and opinions. Split over two floors, the Drunk Animal offices are home to 14 staff, bringing together many freelancers and associates who have been working with the company for years, as well as new starters from a range of sectors and disciplines. The creative hub combines traditional desks with adaptable surroundings, which sees each space used for everything from meetings and networking, to managing projects and socialising. As well as the creative hub in the heart of Hull city centre, Drunk Animal has secured multiple spaces in other parts of the city to use for specific activity. One example is a newly acquired warehouse for planning, building and storing art installations and information stalls, as well as experimenting with different materials for potential projects. Meanwhile, by working with proactive leaders in specific industries, such as dining, retail, music and performance, the agency is rapidly strengthening its collaborative network and encouraging all types of company owners to add creative marketing and events to their promotional activity. This has seen the rolling out of a range of exciting developments that the public can get involved in, such as interactive stalls, fair rides, murals, pop-up bars, live entertainment and large volumes of social media engagement. The previously mentioned team of 14 is still expanding thanks to Drunk Animal taking on large clients on a weekly basis. Recent additions to the portfolio include the University of Hull, the RB group of brands and Hull City. This has justified additional positions that include a Client Liaison Manager, a Social Media Manager and an Office and Administrative Manager, alongside other technical and creative roles such as web developers, copywriters, event planners and videographers. The creative hub welcomes an influx of talented specialists from every creative industry to get involved in a diversity of highly inventive branding concepts. This is paired with Drunk Animal’s work for ENRG, the business coaching service, which has enabled Calvin and his team to meet countless start-up owners, artists and sole traders who are passionate about the region’s economy and cultural offering. Together, they are delivering outstanding work for households names, with current examples being the University of Hull’s My Plastic Pledge drive at the Humber Street Sesh & Freedom Festival, the Gaviscon Challenge for RB, a turtle created out of 15,000 recycled plastic bottles for the University of Hull at the British Science Festival and a campaign for Durex using tongue-in-cheek humour to circulate important messages about sexual health. To further assist the establishing of the Drunk Animal offices as a creative hub, a 1930s blues-style bar is being constructed in the basement for brainstorms and demonstrations. With offerings from local brewery Atom Beers and a sustainable selection by Wines Online, this will be the perfect spot for small networking events with guests who are targeted for their potential to pool skills, connections and resources. The innovative hub is also home to a weekly YouTube video series channel, where talented specialists analyze marketing campaigns, provide free marketing tips for local businesses and share their thoughts on creative topics in general. Not stopping there, Drunk Animal Creative Studio also specialises in interactive marketing and events. They have a history of creating vibrant and interactive displays for a range of festivals and focus their talents on raising Hull’s level of events delivery to the national standard. 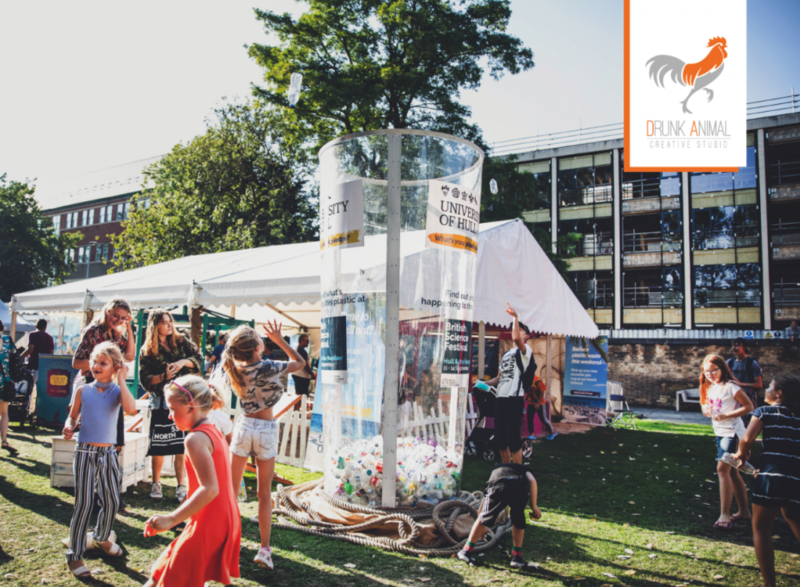 They believe that a brand’s presence at an event requires far more than just a stand and some flyers, which is why Drunk Animal has brought together connections in particular areas of expertise, particularly music, logistics, building and events delivery. Their team of experts now offer a comprehensive service so that clients don’t need to split jobs between different agencies. In turn, this all-under-one-roof approach has enabled them to work on larger campaigns than ever before, such as the University of Hull’s My Plastic Pledge drive, installations for the British Science Festival, the heritage site for RB and sexual health campaign for Durex. With new upcoming campaigns covering the East Yorkshire region as well as the length and breadth of the UK, there’s no doubt Drunk Animal will look to put Hull on the map as leaders of interactive marketing and raising the standard. Be the first to comment on "A World-Class Creative Hub for Hull"